would like to know if there is an advanced strategy guide . All I find Is basic advice . Which doesn't explain how the real up to date game works . There are a number of guides on Steam. I recommend this one. One important strategy that it seems many people do not realize is concentrating on a few (or just one) key worlds and focus everything on them. After playing quite a few games with Intrigue I'm even convinced now that the most effective strategy is to focus everything on ONLY your homeworld for at least the first 150 turns. If you are playing on the higher difficulties you absolutely should try this out one day. It enables me to dominate a game on Genius difficulty pretty much from the beginning. What do I mean by 'focusing'? Race was Vigilant Conquerors btw. Thank you for sharing that. I have been looking for a way to build tall since I always go wide and here it is !! I also got several planets to the point of producing a citizen every few turns . A flood of citizens when you reach critical mass is devastating to the opponent. No secret just hard work . I like that focus idea very much . Vince Lombardi of the green Bay Packers coached his team to do the power sweep and no one could stop it . do it simple and do it better than anyone . A nice side effect of it is that I don't have to worry anymore about a bad starting position (as long as HW is not at the very outer edge of the galaxy). It doesn't really matter how many planets I can colonize in the initial rush and how good these are - as long as I can get a decent number of asteroids I can be sure that my HW will rather soon outproduce whole AI empires. Thank you for your PM, I was not aware of this trick. Though it's a bit cheesy, I will definitely use it if I play on Incredible or Godlike. 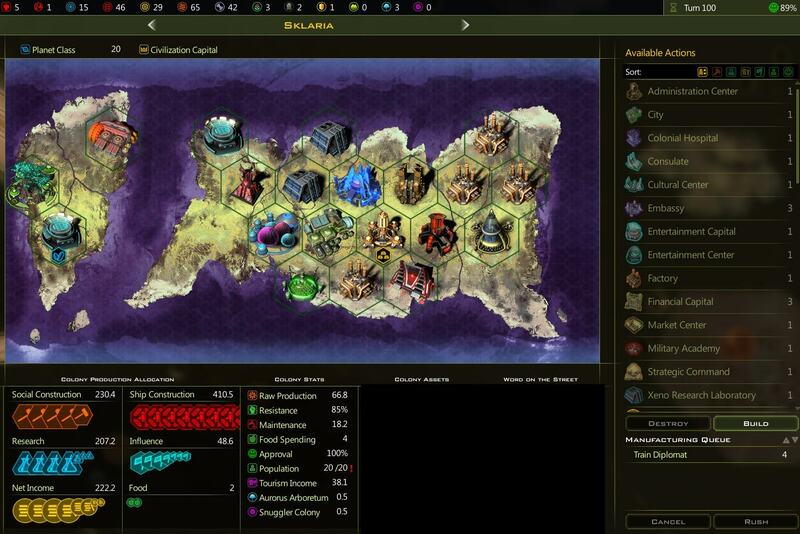 You conquer (or get gifted) an AI planet that has the bulk of their citizens assigned on it. You could recall the Scientists, Workers and Engineers to your pool, but it will cost a lot of Promethion. Other citizen types (mainly Entrepreneurs and Celebs) you cannot recall at all. Solution: trade the planet to some other AI civ, this will automatically transfer all the citizens to your pool at no cost at all. Then reassign them to your HW or other good planet. The citizens are often more valuable for you than the planet itself. If you are a really mean mofo, you could even park a transport next to the planet before gifting it to a very weak AI civ. Then declare war on them and take it back the next turn. Yes, the ability to produce lots of citizens will seal the deal in any game. - Diplomatic Corps enables you to recruit both Diplomats and Celebrities on the planet you built it on, for a much lower cost than via the Recruit Citizen project. Especially the Celebs are useful so I always try to get it. - Discovery Sphere enables you to recruit Scientists on the planet you built it on, again for a lower cost than Recruit Citizen. Ha, I use the "secret method" all the time. Until it is fixed (maybe it takes N turns to change capital planets) I will consider it cheesy and very useful. What is the cheesiest or most deceptively powerful ship you can make if I don't want to use carriers. I also found the AI planets to have extraordinary income after capture which I could not reproduce . Is there a method for this as well ? Race Traits and or Difficulty cause this. I have not actually tried it out, but a quick estimate tells me that the resulting fleet should have an attack value in the millions. This is way beyond of what any carrier-based fleet could achieve. I hope the game can handle that. Why 63 you may ask: IIRC you cannot field more than 64 ships in a battle at once. You should actually go Vigilant and Starfaring and build Hyperion Logistics System on a planet that sponsors your main shipyard. You can then build a fleet of 63 small instead of tiny hulls. Thank you and please continue to share . I have no doubt other players like these ideas and have their own too . But the question was for a ship, and not a fleet of ships. 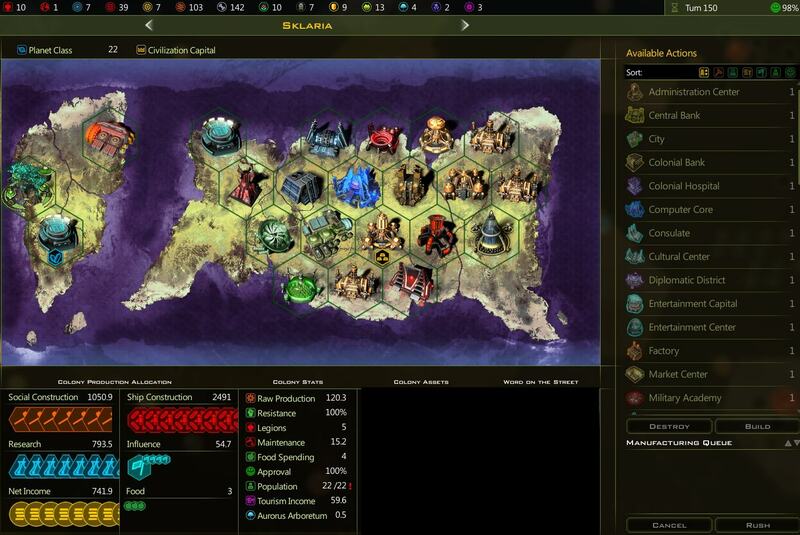 Yah i found out the other day to my surprise if im about to lose a planet with citizens that is about to get culture flipped, i make a commonwealth. The most powerful ship is a huge hull packed with nothing but Nightmare Torpedoes accompanied by 63 small hulls packed with nothing but Zalon Defense Systems. If we are talking a single, unaccompanied ship, I would lean more toward a tactically fast huge hull loaded with kinetics and its corresponding support modules. No engines, sensors, or life support. If you take out all life support, and engines, unless hes making a defender that wont help in the long run. I suggest one engine, and one life support, unless it is only a planet defender. I'm not sure if some of those buffs are better than just pure power though . What buffs are your favorites ? And are there trick combos that are not obvious ? I did notice a big change with carrier modules . They don't regenerate like they did or ever in some cases . It's good in a way to see because they were OP . But there are times when I wanted the ships back . Am missing something ? So my dreadnaughts are much better in many cases . According to the xmls, last I checked, fighters take 3 turns to respawn. Unfortunately, the best "single" ship outside of carriers is really just a ship with tons of capacity and specialized in one weapon type with all corresponding support modules and the Bane (since it is normally limited to 1). This is because numbers in the game can easily trump any single powerful ship. There really is no trick or gimmick to it. This game's ship combat system is pretty straightforward. There is no such thing as the "best ship by design". It heavily depends on what you want to achieve with that ship (its "mission"). - Try to get along without using engines, they use up a lot of space. Instead research techs that give +1 to Moves and use support ships with speed-enhancing fleet modules (exception: dedicated main-map interceptors). - Do not use life support components. Build a starbase on the way to the enemy instead. But most importantly: all combat takes place between fleets. So I don't really get your fixation on individual ship designs. I mean, you don't send your ships one by one to your enemy, do you? For this reason, you must look at fleet composition as well (not just at ship design) if you want to min-max the whole damn thing. And here, like I already hinted at in a previous post in this thread, stacking attack-enhancing fleet modules is king. The more hulls in a fleet the better. In a fleet context, no huge hull based fleet could ever hope to stand a chance against a Medium/Small/Tiny based one that stacks attack-enhancing fleet modules. Not even if the huge hull fleet is carrier-based. Design a small or tiny support ship with nothing but sensors. Design a small or tiny support troop transport. Include these ships in your attack fleets (they use up very few logistics points). This way they are protected by your main combat units and you don't have to move them separately. Huge QoL improvement for me. Ok thanks . I was just looking for innovations and the suggestions are good. And I do make huge fleets of course . Yes, early and mid-game one (self-healing) ship might be enough. But later, and especially on the higher difficulty levels, the AI can build some pretty nasty ships. So you have to create something even nastier. Now that's a neat idea, haven't thought about this. I will try this out one day. You give the AI too much credit. Even on Godlike, all you need to decimate the AI's fleets is one ship with an average of 400-500 in every defense, at least two weapon types averaging around 400, and all the single-ship support modules relevant to your choice of weapons. No self-repair needed. The only real reason you need to make more than one is for map coverage.